The leadership of the Indigenous People of Biafra, IPOB, has alleged a fresh plot by the federal government to re-arrest its members recently released by an Abuja Federal High Court through an article published on an online newspaper which was authored by one Kunle Olasanmi. Speaking through its Media and Publicity Secretary, Comrade Emma Powerful, IPOB said Olasanmi’s publication, sponsored by some state agents reveals the intention of the security agencies to re-launch an attack similar to that of Operation Python Dance that culminated with the missing of its leader, Nnamdi Kanu, against its four members currently enjoying bail. It therefore, described Olasanmi’s publication as mischievous, deceitful and an attempt to mislead the general public through its subtle move to re-write history, warning the Nigerian authorities to respect the decision of the court which ordered that the peace and privacy of the four defendants should not be breached by the security agencies pending the end of their trial. The statement released on Sunday reads that “Our attention has been drawn to a publication in the Leadership newspapers online news titled "Blame game over Kanu's whereabout" which can be accessed via the link https://leadership.ng/2018/07/26/biafra-blame-game-over-kanus-whereabout/. “This article was credited to one Kunle Olasanmi. A cursory glance at the publication reveals the dark motives of the author, who to all intent and purposes is an agent of the state. His expositions as conveyed, calls for serious caution and commensurate alert on the part of the public that they might not be misled. “It is a matter of common knowledge, backed by quantum and incontrovertible photographic and video evidence, that the murderous military invasion of Mazi Nnamdi Kanu's (leader of Indigenous People of Biafra) home on the 14th day of September 2017 and his abduction therein by the invading soldiers was an occurrence which the international community and responsible human rights bodies, such as Amnesty International had severally indicted the Nigerian military. “The Nigerian army's involvement in the invasion and massacre of defenceless and unarmed members of IPOB present in Afaraukwu on that fateful day of 14 September 2017 is the irreducible and constant critical point of reference in any discussions regarding the whereabouts of Mazi Nnamdi Kanu. “It will be fair to say the warped views expressed by this Kunle in this newspaper publication is mischievous and deceitful, aimed at misleading the public. Such calculated attempt to rewrite history and absolve a culpable Nigerian state of their complicity in the disappearance of Mazi Nnamdi Kanu must obviously enjoy the funding/sponsorship of the state. “The subliminal message being conveyed by this vicious author is that plans are at advanced stages for another possible military invasion of the South East and parts of South-South. 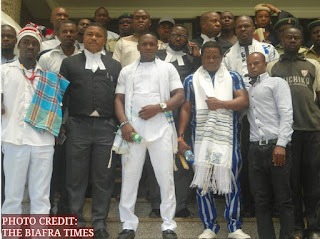 We envisage another extra-judicial murderous attack on the homes of Nnamdi Kanu's co-defendant that were only recently granted bail after spending three years in prison custody for a crime that does not yet exist. “Needless to emphasize that Justice Binta Nyako had, pursuant to application made in open court by IPOB lawyers, placed a ban on any form of threat or invasion of Nnamdi Kanu's co-defendants' homes. The judge ordered that no security personnel should disturb the peace of Benjamin Madubugwu, Bright Chimezie, David Nwawuisi and Chidiebere Onwudiwe. “Kunle's futile attempt to ignore this version of the order again reveals his true motives and gave his article away as a ploy by the Fulani-controlled DSS and military to launch another murderous invasion of Biafraland. “The essence of this rejoinder is to put the record straight and correct the carefully packaged lies being sold to the gullible public by this mercenary going by the name Kunle. Most importantly, we are obliged to put the international community on alert about this latest plan by the Buhari regime to disrupt the peace in both South East and South South. Should anything untoward happen to Nnamdi Kanu’s co-defendants, this Buhari regime must be held accountable for it. Let the Government refrain from any act that may jeopardise the bail granted to the four innocent Biafrans.